Ahmad, a fictitious Muslim friend, wishes to hear about my experience as a Christian and the truth about God, Jesus, church, and spirituality. But he cannot hear me beyond the rattle of so much hypocrisy in the West. Though America has historically been known as a “Christian society,” he points to the immorality pouring from Hollywood, the rampant substance abuse, homosexuality, and confused gender roles, and wonders why the Christians are doing so little to influence their culture. Ahmad is perplexed as to why Christians pray so little and why all too often they are hardly different than the unsaved around them. He wants to know why becoming a Christian would require him to change his name and lose his Muslim cultural identity. In essence he notes that losing his identity, vocation, and family to become a Christian like what he has witnessed in the West would never be worth the sacrifice. In the past several decades we have become accustomed to the newly contextualized terms tolerance, relativism, and even karma in socio-religious discussion. But a very ancient term which is rocketing to the socio-political and religious forefront is jihad, which essentially means to strive or struggle. In the Islamic fundamentalist context, it additionally takes on militant and violent connotations. In respect to Ahmad’s statements, what would motivate him to commit to jihad instead of choosing the peace proposed by Jesus? This is an important question for Christians anywhere, especially those of us in the West seeking to be Jesus’ witnesses. 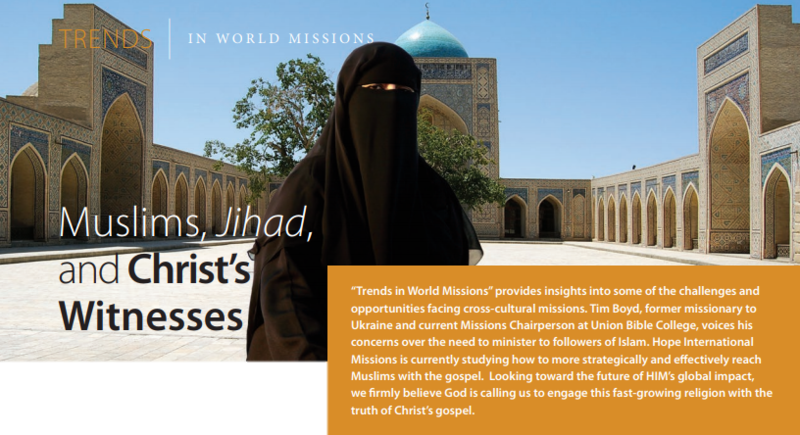 Trends in contemporary missions are forcing Christians to assess what it will take to influence Muslims away from the fundamentalist perspective of jihad and accept a relationship with a loving Christ. It is important to remember there is hope for influencing them with the Gospel. Muslims want to see Christians who are transparent, authentic, and empowered in their witness by the Holy Spirit. They want to see that Christianity as a religion actually affects radical change in people’s lives. Sadly, many Christians find it difficult to react toward Muslims in a Christlike way. They point to the recent migration crises in Europe as a less militant ploy by Muslims to spread their religion. It is true that Islamic fundamentalist groups have openly outlined strategic plans to reduce Europe’s Christian influence by migration and exploding birth rates among their people. This is readily evident by a visit to just about any city in Europe. How then are Christian mission works evaluating this situation? What response should we take? It seems our first response is fear. Perhaps we also respond with anger or repulsion. Both of these responses invoked the Crusades of the late Middle Ages, for which the Muslim community remains embittered at Christians. Trends in ministry to Muslims must continue to follow the Lord’s directive to be neighbors, demonstrate an empowered witness, and be a transparent friend of these people in truth. Muslims who are going to be influenced are not looking for a deep apology against their beliefs, but for Christ’s witnesses who are holy and real. May God help us all to love as He loves and change the Islamic community with truth of the Gospel.